There are many free sites out there, and a Miami web design company can customize it to your liking. Below are the top 5 blogging platforms for small business blogging. Every small business website needs to have ever-changing quality content. While a blog is not the right solution for every website, it is a good tactic for many. Blogs allow for content to be posted regularly on a website. While home page content, and other informational pages within the website typically do not change very often, blogs can be updated as often as you choose. 2-3 posts quality posts per week is usually good practice, although in the beginning posting once a day can really help build up some quality content in your blog. One of the hardest things to decide on is what platform to use in order to create your blog. 1) WordPress -WordPress is free and very simple to use. It come equipped with a really basic formatting toolbar similar to the one Microsoft Word has, so if you are already familiar with that popular word processing program, then WordPress will be very easy to get used to. You can include photos, videos, hyperlinks and it also comes with an All-in-One SEO Pack that helps you format the page title, description and tags correctly. 2) Blogger – Blogger is owned by Google, so it already comes with a great built-in support system. It also has a very simple dashboard and toolbar, like WordPress, so it makes it simple to just start blogging as soon as you create an account. You can also have a Miami web design company easily customize your blog to better match your existing website. 3) Blogspot -Blogspot is also a great place to start a small business blog. Once again, very simple to use, and you get your own unique url (name.blogspot.com) which is search engine friendly. Once it is attached to your website though, you may want to buy a domain that does not show you are using a free service. 4) Blog.com – Blog.com has free blogging features as well as paid ones to help enhance your blogging experience. It is simple to use and can easily fulfill all small business blogging needs. 5) Weebly – Weebly is also a site that allow you to create a website, and then incorporate a blog into it. It has received high awards from TIME magazine and offers a great template system that is simple to navigate through. If you are unable to afford a professional web design to start out, this is a great website to get a site up and running with a blog attached to it rather quickly. Do you have a small business blog hosted by one of these blogging sites? How do you like it? Have you ever used a blogging platform that is not mentioned here? 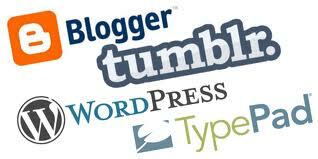 Comment and share your thoughts on blogging platforms with us!